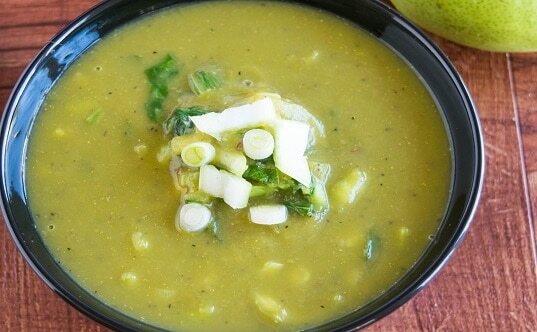 Fresh Pears, baby Bok Choy, baby kale, leeks and green onions simmered in freshly made homemade vegetable stock and flavored with garlic and cumin seeds and spiced with some black pepper. I was trying Detox diet for the first time and I selected Monday for it after fun frolic indulge filled weekend. 🙂 . I have never felt so good before. Detoxing on a regular basis can be really helpful. It just cleanses your body, make you feel light and happy. Makes you feel good about yourself. Also your stomach feel light and not bloated at all. In a saucepan combine kale, pears, leek and vegetable stock and boil until leeks are tender. This may take 4-5 minutes. Turn off the flame, let it cool for a while and blend it smooth. In another sauce pan heat oil. Add garlic and cumin seeds. Pour the blended soup into the pan and add salt and pepper. Boil for couple of minutes and serve warm with your favorite bread/soup sticks.